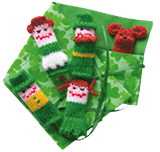 KBC Products has a beautiful selection of Irish Keepsakes for both young and old. KBC Products is happy to introduce our clients to our newest and cutest product. My Very Own Finger Buddys. These adorable little finger puppets are hand crafted and available in 8 unique and colorful sets with 5 characters in each set. Displayed here is our Irish Buddy's set complete with an Irish Setter. Now you can keep little hand busy for hours. A delicate white lace handkerchief hand-crafted into a beautiful baby bonnet. Available with white satin ribbon ties. 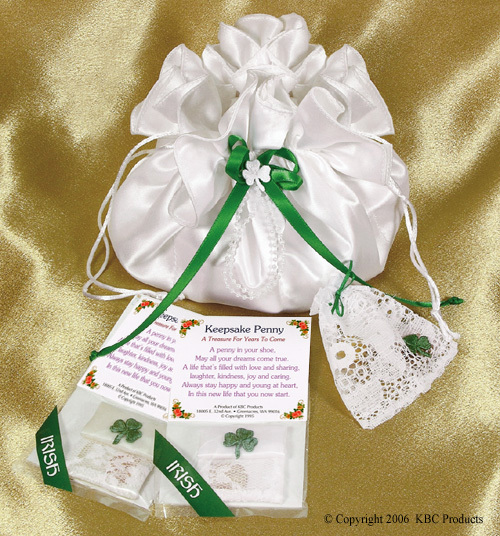 Each bonnet comes with an Irish poem. The bonnet is then tucked away and years later it becomes the "something old" as a wedding handkerchief by simply clipping the stitches. Individually packaged in a clear box with full view of the poem. 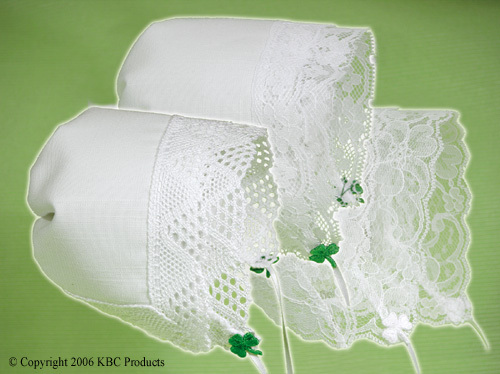 When ordering, specify cotton, linen or linen with Cluny lace and white or green shamrocks. Attractively packaged in a clear gift box. Church Babies In days of old when families worshiped together, if the children became restless during the service, grandmother took the handkerchief from her pocket and tied it into a church baby. If dropped on the floor it didn't make noise and disrupt the sermon. Years later the handkerchief was carried on the wedding day. 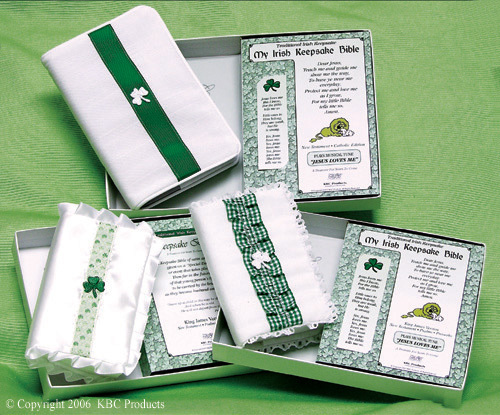 Linen handkerchiefs are available with white, tea dye and mocha faces with green ribbons and a green embroidered shamrock. Packaged in a clear gift box. Guardian Angel A special keepsake with many uses. Hang above baby's crib, a child's bed, a nursing home patient's bed or a great gift for angel collectors. These angels are crafted with beautiful hand-painted porcelain, white lace and cotton gown and Battenburg lace. Each angel comes with a lovely poem about guardian angels watching over from above. Choose from two looks: child or adult. 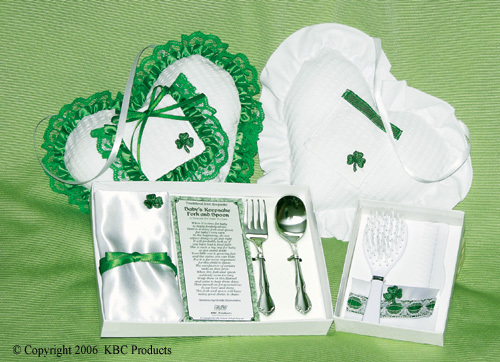 Includes green satin ribbon and green embroidered shamrock. Attractively packaged in a clear gift box. Not intended as a toy. Tooth Fairy Pillow An adorable heart shaped pillow to decorate baby's nursery, then used as a tooth fairy pillow, later to be passed on to their children. These brightly colored keepsake pillows play the tune "Twinkle, Twinkle, Little Star." Fabric colors include white with white gathered fabric & green Irish accents or white with green gathered lace and green Irish accents. Each hang from a satin ribbon. Packaging includes a sweet poem in a clear gift box. Brush & Comb Set No longer available. Fork & Spoon Set A wonderful gift for every baby. Baby's first feeder set is manufactured by Oneida Silversmiths. It is the stainless Chateau pattern. 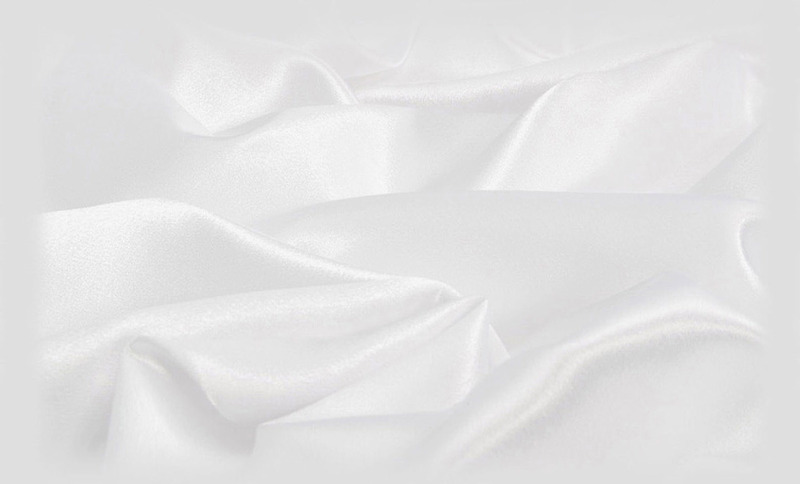 Included is a silver keeper in white satin with an inside fabric of white flannel. "In the beginning, do not expect things to go just right. It will probably look as if you have had a food fight. This is such a big step for baby so just stand aside. Your little one is growing fast and the stains you can hide." Packaging includes fork and spoon, silver keeper and poem. Nicely packaged in a clear box. Irish Catholic Baptismal Bible A pocket size New American Catholic Edition New Testament. A very special gift for a very special day in one's life. Each Bible has a beautiful white satin cover with a green ribbon trim and a gold shamrock charm. The Bible is edged with ruffled satin ribbon or white piping. Packaging includes a poem and Ephesians 4: 5-6. Nicely packaged in a clear gift box. Irish Baptismal Bib A very clever gift for baby that just keeps on giving. A lovely bib to be worn on their Baptismal day. Later, clip the charm from the bib, add a small chain and it can be worn as a necklace. Then on the wedding day, clip a row of stitching and a wedding handkerchief it will be. If the bib was worn by a boy, he gives the handkerchief to his bride to carry. Accented with a green embroidered shamrock. Choose cotton, linen or satin, with a silver cross. Nicely packaged in a clear gift box. A pocket size New American Catholic Edition New Testament. This fine keepsake is a great gift idea for any person receiving their First Communion. Each Bible has a luxurious white satin cover with a lovely ribbon trim and a gold shamrock charm. The Bible is edged with either a white ruffled satin ribbon or white piping. Packaging includes a poem and John 6:51. Nicely packaged in a clear gift box. My Irish Keepsake Bible A pocket size New Testament - KJV or The New American Catholic Edition recommended for ages 0-12. When the bow on the cover of the Bible is pressed, the tune "Jesus Loves Me" softly plays. Included is a matching bookmark with the printed words to "Jesus Loves Me". Color choices include a white satin fabric with green and white checkered ribbon or green grosgrain ribbon. Nicely packaged in a clear gift box. Irish Keepsake Bible A pocket size New Testament - KJV or The New American Catholic Edition for a young person of any age. The Bible is given on a special day or event that takes place, then saved for the bride to carry on her wedding day. Boys save their Bible for their brides to carry. 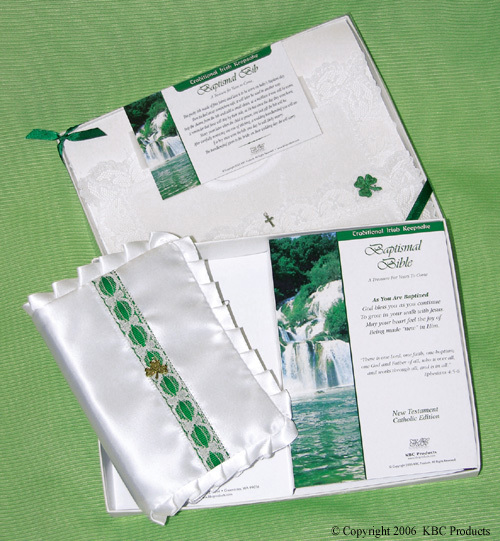 Each Bible has a luxurious white satin cover with a beautiful trim in green with an embroidered green shamrock. The Bible is edged with a white ruffled satin ribbon. Packaging includes a poem and Proverbs 22:6. Nicely packaged in a clear gift box. A white cotton hankie with a lace border has been cleverly made into a corsage. 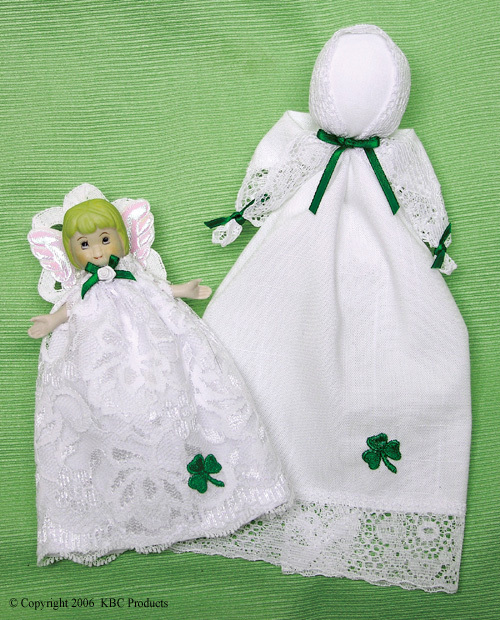 We have added white satin leaves and an embroidered green shamrock. The corsage makes a perfect gift for a mommy-to-be to wear at her baby shower. If the baby is a girl, years later the corsage is taken apart and carried as a wedding hankie. If the baby is a boy, he gives the hankie to his bride to carry. Included are a sweet poem and a corsage pin. Packaged in a clear gift box. 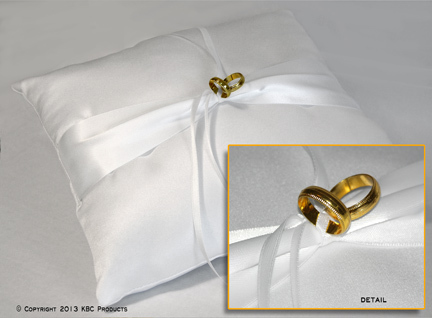 An elegant pillow for the ring bearer to carry is available in five style choices in white or ivory satin. These Keepsake pillows are to be passed on from generation to generation. Each is beautifully decorated with Irish embellishments and includes a moving poem giving the significance of the wedding ring. SMALL - The smaller, very affordable pillow. 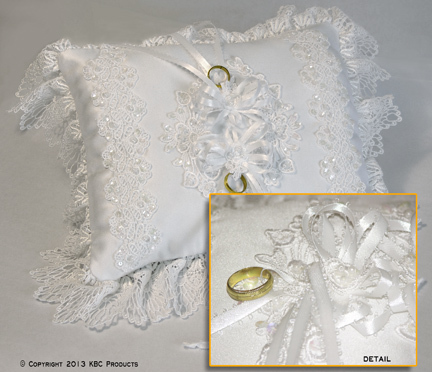 Approximately 8 1/2" x 6 1/2", edged in 1" ruffled lace with 1/2" ruffled satin ribbon, hand decorated similarly to the STANDARD pillow. Choose from two poems. The same poem used for the other three pillows or a clever new poem, "A Keepsake Pillow For The Ring Bearer." 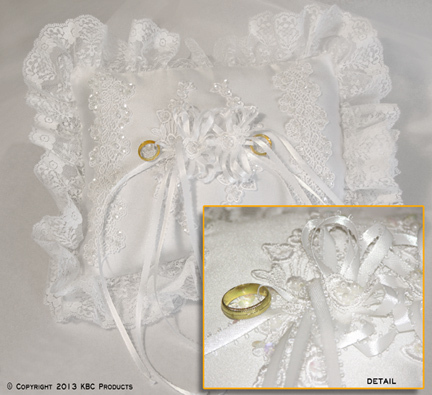 This smaller pillow makes a wonderful gift for the ring bearer. 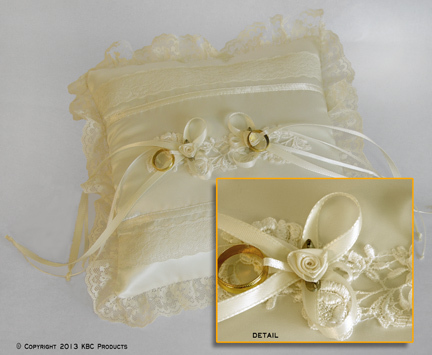 This item compliments the Keepsake Flower Girl Memory Bag. Packaged in a clear gift box. 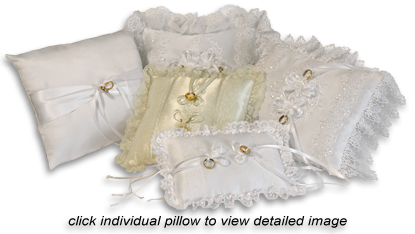 All pillows above make a great gift for the Ring Bearer and are beautifully decorated with Irish embellishments. Ladies These beautiful white handkerchiefs will catch the tears of the mothers of the bride and groom. Each handkerchief comes with a touching poem that will bring tears even before the ceremony begins and will become a keepsake of their children's wedding day. Each is embellished with an Irish accent. Attractively packaged in a clear gift box. Handkerchief patterns vary. Men A 13"x13" white cotton handkerchief for each and every male in the wedding celebration. Poem choices include Father of the Bride, Father of the Groom, Groom, Best man, Groomsman, Other father, Usher, Stepfather and Grandfather. Each includeds a gold shamrock lapel pin. Packaged in clear gift box. Same beautiful handerkerchiefs as above but for Grandmother, Stepmother, Bride, Sister, Matron of Honor, Maid of Honor, Bridesmaid, Flower Girl and Candle Lighter. 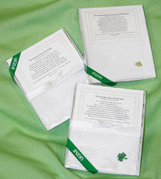 Each handkerchief has a sentimental poem and is packaged in a clear gift box. 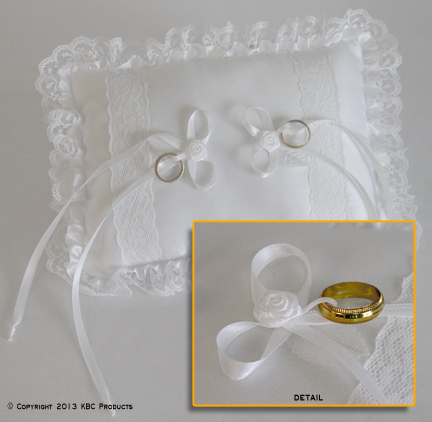 A white cotton hankie with a lace border has been cleverly made into a corsage. 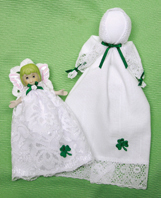 We have added white satin leaves and an embroidered green shamrock. The corsage makes a perfect gift for a bride-to-be to wear at her bridal shower. The corsage is to be taken apart and carried as her wedding hankie. Included are a sweet poem and a corsage pin. Packaged in a clear gift box. Irish Bridal Memory Bag A rich satin bag tastefully decorated with green satin ribbons, a pearl spray and satin roses. The bag is fully lined and has eight individual pockets to keep contents separated. Available in white or ivory with an accompanying poem explaining several uses to the bride, with the most common to be used for the money dance. Attractively packaged in a clear gift box. Irish Keepsake Penny A lucky penny in a shoe has been a wedding tradition for hundreds of years. A small envelope made of satin and lace holds a shiny new penny. 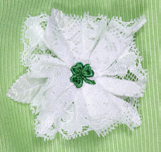 Available in white satin with white or green shamrock and ivory satin with a green shamrock. Packaged in a clear cello bag. Irish Good Luck Satchel A lace satchel filled with tokens to bring good luck to the new couple. Includes a threaded needle to stitch the satchel to the inside hem of the wedding gown. 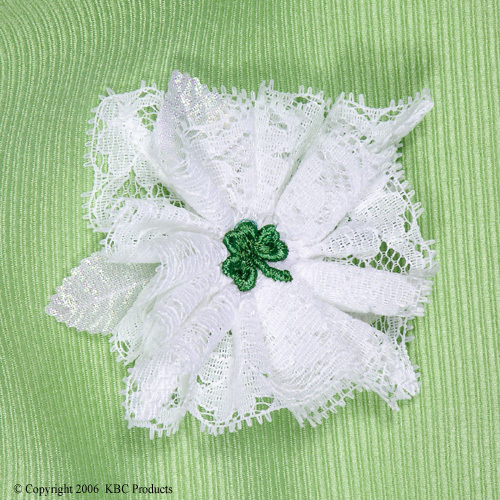 Available in white satin with white or green ribbons and white or green embroidered shamrocks or ivory satin with green ribbons and shamrocks. Each is accompanied with a poem explaining the satchel. Packaged in a clear gift box. Irish Wedding Garter This beautiful lacy wedding garter is gift boxed singly or in pairs (one for the bride to keep and one for the groom to throw to the eligible bachelors). Available in white with white or green Irish accents including a sterling silver shamrock charm or ivory with green Irish accents. Irish Wedding Heirloom Garter A gorgeous, elegantly decorated garter that is intended to pass on from generation to generation. A beautiful 5" lace tastefully decorated with satin or chiffon roses. 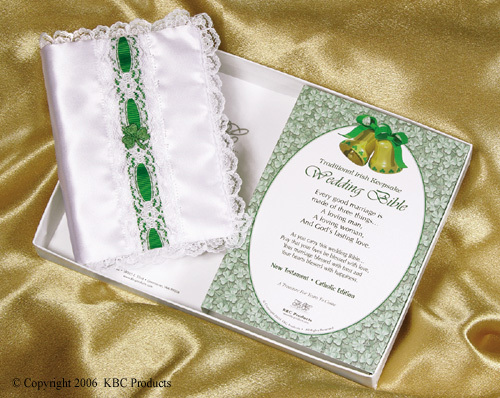 Each garter includes a lovely poem and a bridal registry card on which the bride and groom's birthdates and their wedding date are recorded. Available in white or ivory embellished with Irish accents. Nicely packaged in a clear gift box. 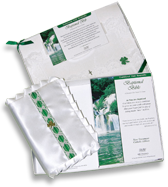 Irish Ring Bearer Pillow An elegant pillow for the ring bearer to carry is available in five style choices in white or ivory satin. These Keepsake pillows are to be passed on from generation to generation. Each is beautifully decorated with Irish embellishments and includes a moving poem giving the significance of the wedding ring. A pocket size New American Catholic Edition New Testament for the bride to carry to the altar. 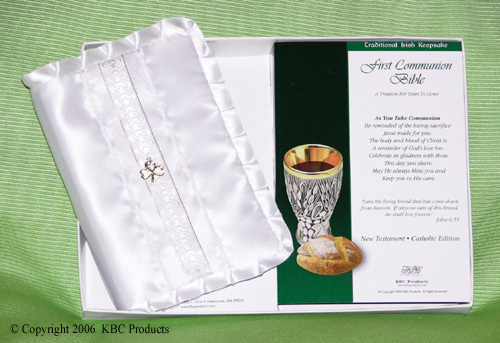 Each Bible is covered in a luxurious white satin with green satin ribbon and a green embroidered shamrock. The Bibles are beautifully trimmed and edged in feminine lace. Packaging includes beautiful printed thoughts about love and marriage. Nicely packaged in a clear gift box. 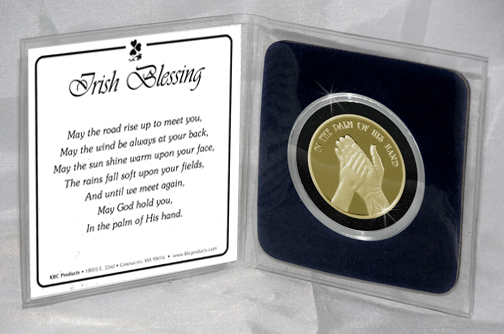 Very special keepsake medallion for any Irish event and any Irish recipient. 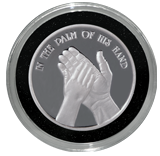 These medallions, designed and minted exclusively for KBC Products, This medallion shows the open hand of a man's hand holding a child's hand. On the medallion it reads, In The Palm Of His Hand. The back of the medallions have a decorative border around the perimeter with the center left blank to accommodate engraving. Available in genuine brass or .999 fine silver. Packaged in an airtight container, in a clear plastic flip with a sentimental poem.